Bond Economics: With Summers Out, More Of The Same? With Summers Out, More Of The Same? With Larry Summers withdrawing his candidacy for the Fed Chairmanship, it appears more likely that the new Fed Chair will be more gradualist. Janet Yellen appears to be the most likely candidate. However, since it is unclear why exactly the Obama administration passed over the obvious candidate for a more controversial choice, it is possible that they will again propose someone else. The bond market had a small rally on the news, although this is still not enough to break the technical uptrend in yields. 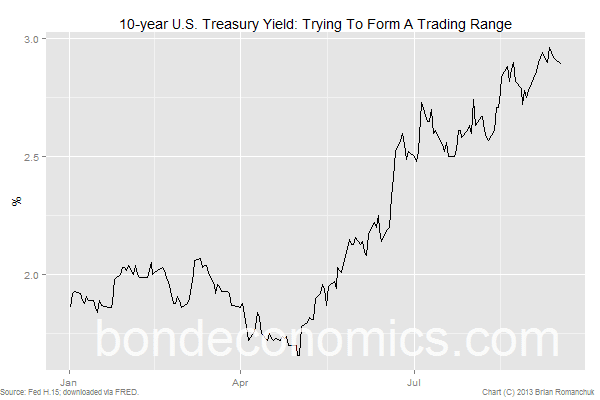 But it still seems likely that a trading range will form somewhere in the general area of 3% on the benchmark 10-year. I feel that it is unclear that the choice of for the new head of the Fed is extremely critical for the medium-term trend in bond yields. As I have argued earlier, the important economic data are locked into steady trajectories by the automatic stabilisers in the economy. 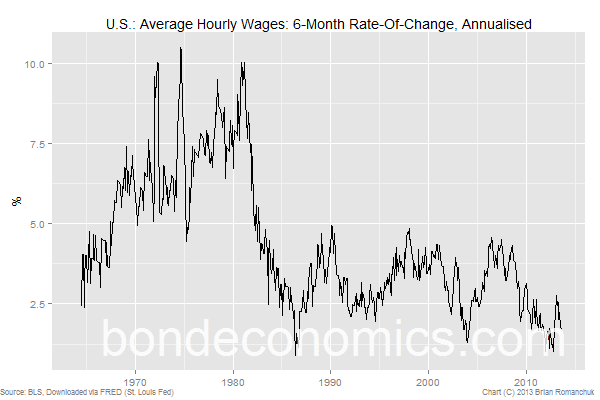 There are no signs of inflationary pressures in the economy; the six-month annualised rate-of-change of hourly wages is only 1.7%, which is a level only previously seen briefly after recessions. There are very few scenarios that would allow a Fed Chair to convince the rest of the committee to hike rates on a time frame of less than 12 months. It is clear the Quantitative Easing will be disposed of in a gradual fashion, as it was unpopular and ineffective. However, the bar for hiking rates is set higher, and it is unclear that the fall in the unemployment rate will be enough to convince the committee as a whole that the labour market is really tightening. A gradualist candidate will be even more likely to wait to see that inflationary pressures are appearing before hiking rates. Eurodollar futures contract are now (roughly) discounting a 1% 3-month rate hitting in June 2015. Even if we add in corrections for the difference between the underlying rate in this contract and fed funds, it still indicates that market expectations already incorporate the scenario of rate hikes starting in the first half of 2015. For this reason, there are fundamental valuation reasons to expect stabilisation in yields somewhere in the ballpark of current levels.